The filing deadline for the November 6, 2018 Village Election is at 4:00 p.m. Tuesday, July 24, 2018 in the Brandon Township Clerk’s office. Beginning Monday, July 9th Cedar (between Ball and Mill) and Schoolhouse Streets will be under construction for resurfacing. 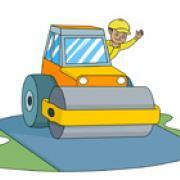 The project is expected to last approximately 3 weeks with minimal traffic disruptions. 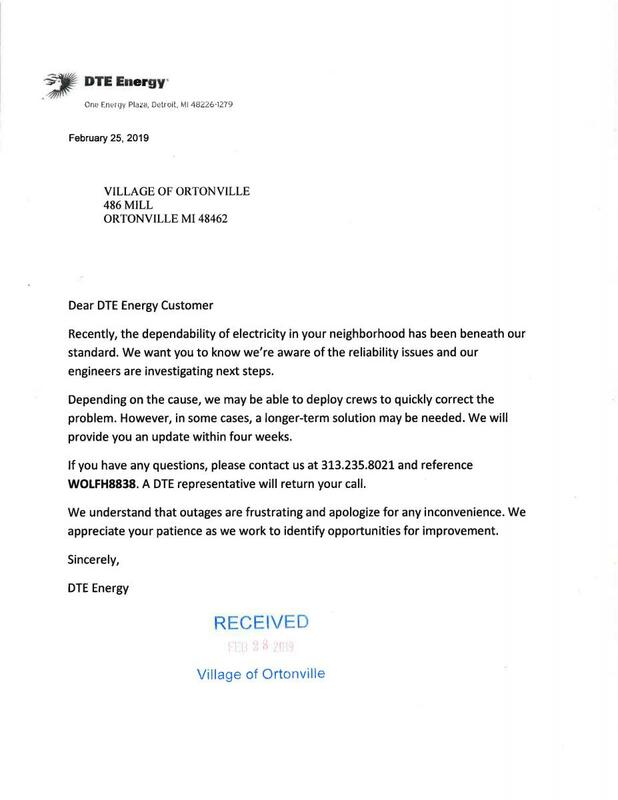 Please contact the Village Office at 248-627-4976 with questions or concerns. ONLINE BURN PERMITS ARE NOW AVAILABLE!!! Permits can only be obtained by going to either Station #1 at 53 South Street, or Station #2 at 3065 S. Sashabaw Road. You are required to fill out the permit and sign it. You will be given a copy of the rules and a calendar of the burning days. Any property owner with three acres or more will be allowed to burn on any day. Brandon Fire Department ONLINE BURN PERMITS. Permits cannot be obtained for those living in either of our mobile home communities, due to their regulations. Burning permits are a privilege. They can be revoked at any time by an Officer of the Brandon Fire Department. It is the permit holder's responsibility to follow the rules and use common sense on not burning on windy days or during periods of drought. The following are the burning rules. Open burning is allowed by permit only. And shall be issued by Brandon Fire Department, subject to the rules of this article. Summer hours (April 1st through November 30th 8:00 a.m. - 8:00 p.m.
Winter hours (December 1st through March 31st 8:00 a.m. - 6:00 p.m. Parcels of less than 3 acres must follow burn date calendar on back of permit. All materials being burned must be from the site. No materials may be brought to the site for purpose of disposal. No burning shall be permitted within 50 feet of any structure. (To reduce this to 25 feet the fire must be smaller the 3 feet in diameter and 2 feet in height.) Provisions shall be made to prevent the fire from spreading. Campfires must be smaller than 3 feet in diameter and 2 feet in height. Dry seasoned wood only. Recreational fires (bonfires) must be no larger than 6 feet in diameter. Must be issued by calling 248-627-4000 on the day the fire will occur. The fire must be extinguished by midnight. Dry seasoned wood only. No burning in road right-of-way. Fire must be attended at all times by someone 18 years of age or older with capabilities of extinguishing the fire. No burning in windy or drought conditions. The size of the pile to be burned shall be no larger than 6 feet in diameter. Remember burning is a privilege that may be revoked at any time. It shall be the option of the fire official that shall dictate the right to burn. Burning violations may be subject to fines in accordance to Township and Village Ordinances. CAN BURN: dry leaves, brush, cut dry grass, papers, wood scraps, dry seasoned wood. To burn a field call 248-627-4000, this will require an onsite inspection. CAN'T BURN: Petroleum products, plastic, rubber, shingles, tires, treated lumber (wolmanized, railroad ties, etc. 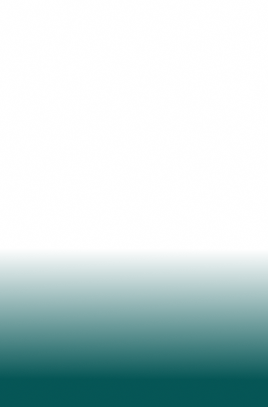 ), wet leaves, wet grass, furniture, cardboard, garbage, manufactured building products, OSB structure board, wet green grass, fiberglass, carpeting, or anything that causes black smoke or an offensive odor. For the purpose of interviewing an applicant for the open Village Manager position. 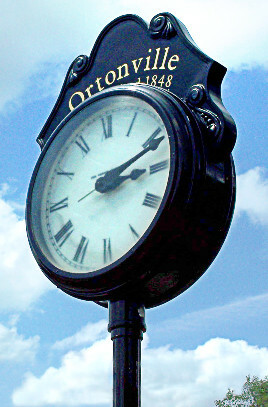 The Village Of Ortonville is looking to fill a part-time laborer position in the DPW department. If you like working outside, desire to be a team player, have a mechanical aptitude, are willing to learn and enjoy handling lawn and garden equipment, we would like to hear from you. Starting salary range of $12.00 - $14.00 per hour. A full job description and employment application are below. Wednesday, July 5, 2017 7:00 P.M. 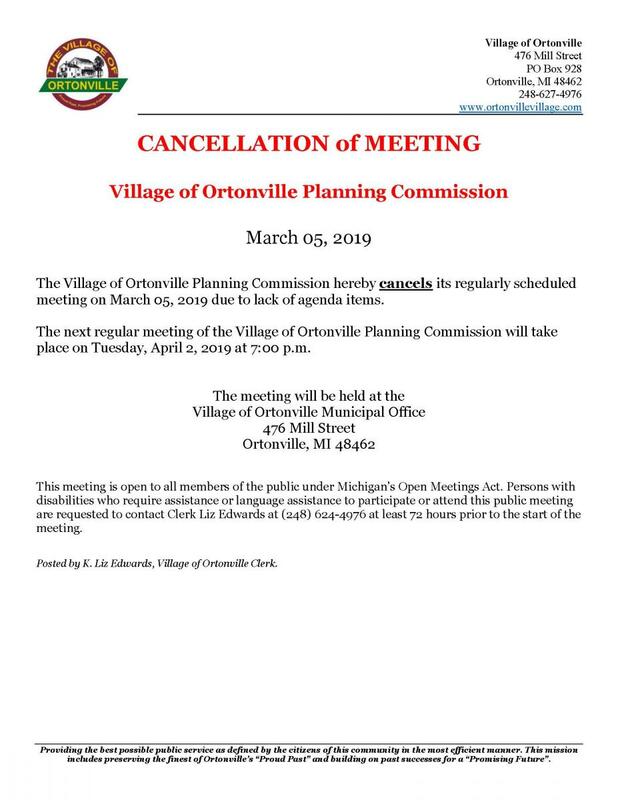 The Village of Ortonville Village Council will be holding a Special Closed Session Meeting for the porpose of personnel evaluation. 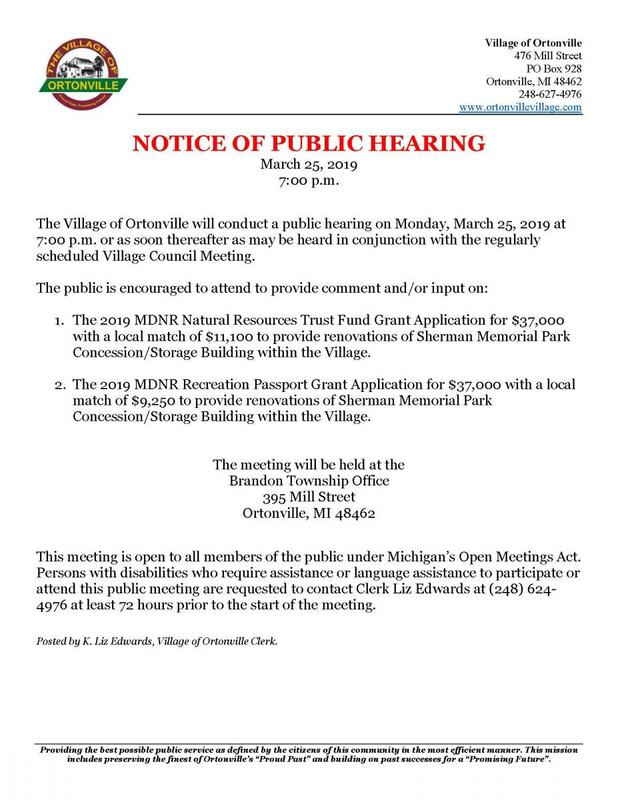 If you have any questions regarding this meeting, please call the Village office at 248.627.4976.
on June 19 2017, for the purpose of reviewing the Village’s budget for fiscal year 2017-2018.
located at 476 Mill Street, Ortonville, Michigan. 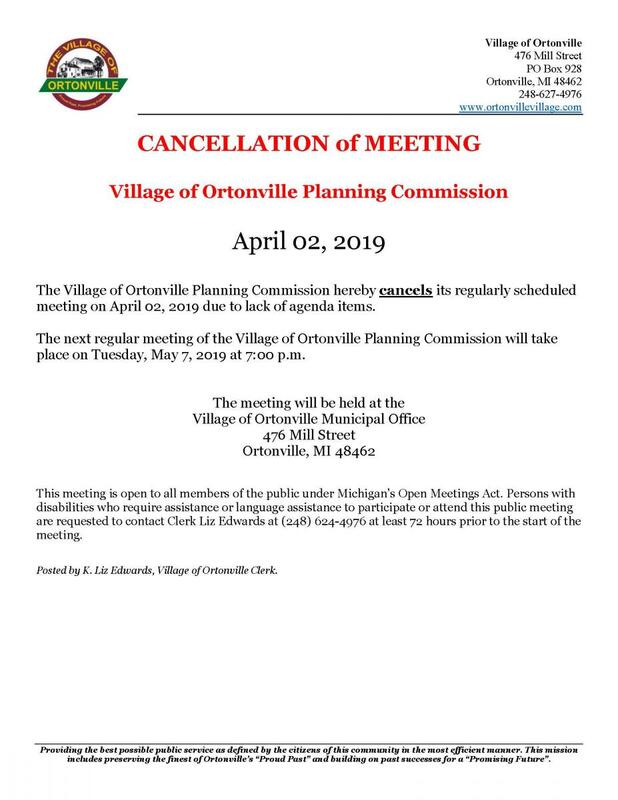 The Village of Ortonville Village Council will be holding a Special Closed Session Meeting for the purpose of: Discussion of proposed settlement offer of current Village legal matters. 395 Mill Street, Ortonville, Michigan. A copy of the proposed budget is attached below. 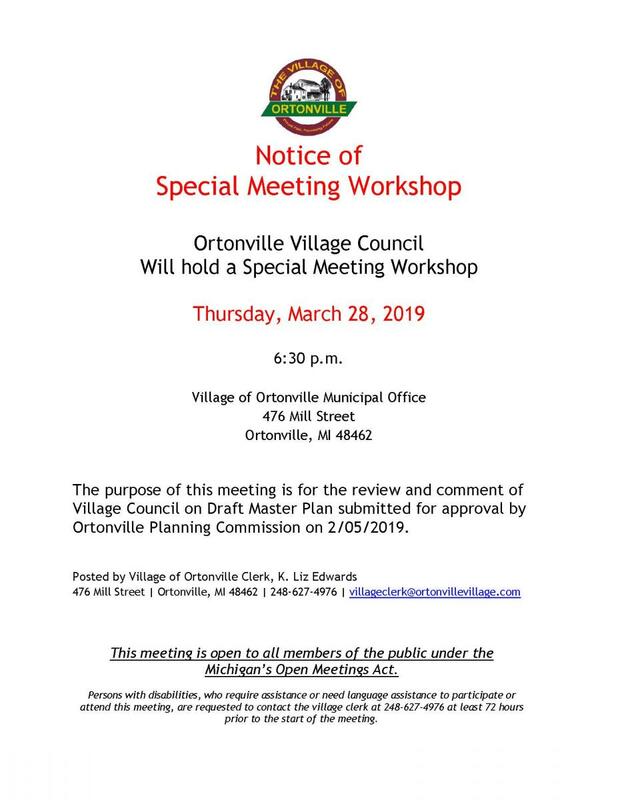 The Village of Ortonville will be holding a public hearing on March 27, 2017 at 7:00 p.m. in conjunction with its regularly scheduled meeting at 395 Mill Street, Ortonville, Michigan. This hearing will be regarding two proposed grant applications for the purchase of properties located in the Village for use in conjunction with the proposed Iron Belle Trail. Both properties could be incorporated into the existing Village Park. Property one is currently held by the Brandon School District, property two is located at 25 S. Church Street. This meeting is open to the public under the Michigan Open Meetings Act. Persons with disabilities, who require assistance to participate or attend this public meeting, are requested to contact the Clerk at least 72 hours prior to the start of the meeting. Contact the Village Offices at 248-627-4976 for further information or special accommodation. A public hearing was held at the regularly scheduled Planning Commission meeting on January 3, 2017 and the amendments were introduced by first reading at the Village Council meeting on January 23, 2017. The amendments were approved by second reading at the February 27, 2017 regular Village Council meeting. It will become effective on Monday, March 13, 2017. A full copy of the ordinance is available for review at the Village office Monday through Friday from 9 a.m. to 5 p.m. 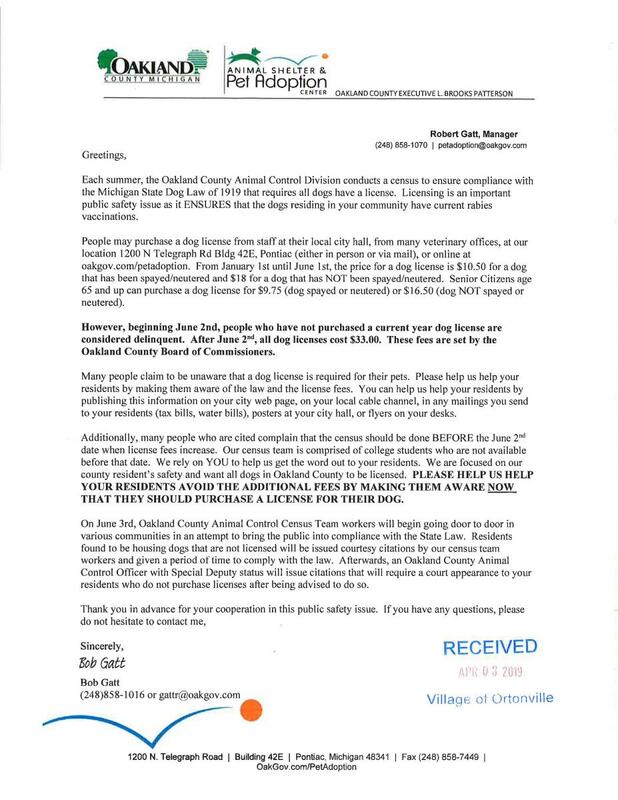 If you have questions regarding this posting please stop by the Village office or call 248-627-4976. A link to the ordinance is below for your convenience. The village of Ortonville is moving forward with a plan to gain funding for a segment of the Iron Belle Trail. Village Manager David Trent said village officials applied last month for a grant through the Michigan Department of Natural Resources. “We’re looking to establish a new trailhead at the corner of Church Street, across from the post office,” Trent said. The plan could include developing a shared roadway system in the village that would accommodate for bicycles on South Street and Mill Street. The proposed trailhead would include a bike rack, signage and some benches. The grant would contribute $35,000 to the project, with a $5,000 in-kind contribution from the village. The village will not know until October or November if they have received the grant. “It’s the goal of the village council to make the village more walkable, and this is one avenue we’re proceeding with,” Trent said. The Iron Belle Trail is a proposed statewide trail system with two routes, both extending from Belle Isle in Detroit to Ironwood in the Upper Peninsula. The township is considering four possible routes for the trail and the village would serve as a small segment of the larger trail. Brandon, Groveland and Atlas Townships are part of the proposed route for the trail.